Nicolas Hulot, the French environmental minister, departs a weekly Cabinet meeting in Paris in February. "I don't want to give the illusion that my presence in government means we're answering these issues properly," Hulot said in resigning Tuesday. Now, more than a year later, Macron's environment minister has delivered his own stinging rebuke — only this time, it's Macron who came in for the condemnation. Nicolas Hulot stunned the hosts of his live radio interview Tuesday by declaring his resignation in protest of the French president's environmental policy. 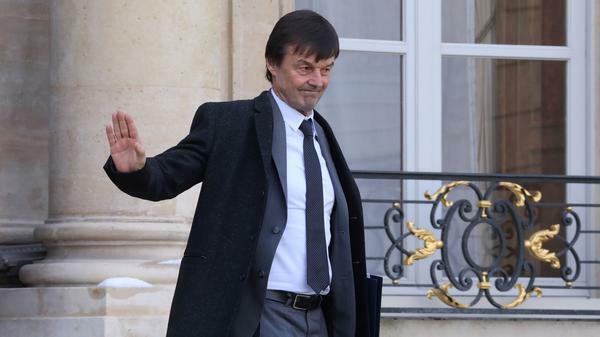 "I do not want to lie to myself anymore," Hulot said on France Inter. "I don't want to give the illusion that my presence in government means we're answering these issues properly — and so I have decided to leave the government." The move deals a stunning blow to Macron's government, which already has been buffeted by bad polling numbers and scandal in recent months — and which was unaware of the popular minister's decision until he said it live on air. In fact, according to Hulot, not even his wife knew about it beforehand. But the former TV presenter and prominent green party politician said his choice — the "most difficult decision of my life" — had been steeped in a series of disappointments. Those include the government's recent moves toward relaxing hunting regulations, as well as its apparent reluctance to fulfill a pledge to slash the share of nuclear power in France's electricity supply to 50 percent by 2025. "Have we started to reduce the use of pesticides? The answer is no," Hulot listed Tuesday. "Have we started to stop the erosion of biodiversity? No. Have we started to stop the artificialization of the land? The answer is no." Later in the day, during a state visit to Denmark, Macron called his minister's surprising move a "personal decision." He defended his government's environmental record, citing his vow to close the country's coal plants and halt hydrocarbon production. The country has also remained one of the most visible defenders of the accord that bears the name of its capital. At least 180 parties have ratified the 2015 Paris climate agreement, which sets targets for reducing greenhouse gas emissions and seeks to limit the rise in global temperatures. "I think that in 15 months, this government has done more than any other on the subject in the same period. More than any other," Macron asserted. "I don't understand why he is stepping down when we had many successes in the first year that are to his credit," government spokesperson Benjamin Griveaux told the French broadcaster BFM TV, according to Reuters. "He didn't win all his battles, but that's the way it goes for ministers." Nevertheless, the centrist French president's political rivals wasted little time seizing on Hulot's surprise resignation as a "vote of censure against Macron." That was the conclusion of left-wing lawmaker Jean-Luc Mélenchon, who described the move as a sign the political movement that swept Macron into power last year is "beginning its decomposition." Hulot, for his part, tempered his own criticism a little. He acknowledged in his interview that "France is doing more than a lot of other countries," as translated by The Associated Press. But, he added, that's not to say "that it is doing enough." "It is not doing enough," Hulot said. "Europe is not doing enough. The world is not doing enough."